The By Terry French Riviera collection for summer 2014 just arrived at Sephora in France. 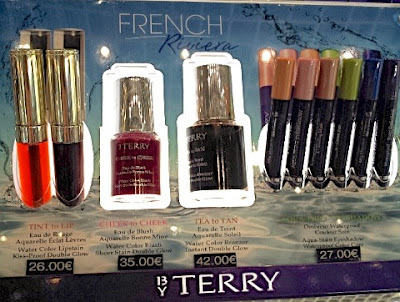 By Terry usually introduces new formulas and product innovations with each seasonal collection, so it's always interesting to see what they have up their sleeves. The theme running through this collection is watercolor stains. 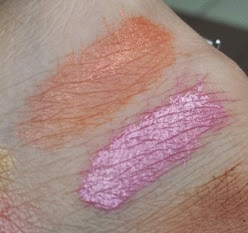 For the lips, there are two Tint To Lip water-based stains in Pink Palace and Beach Game. 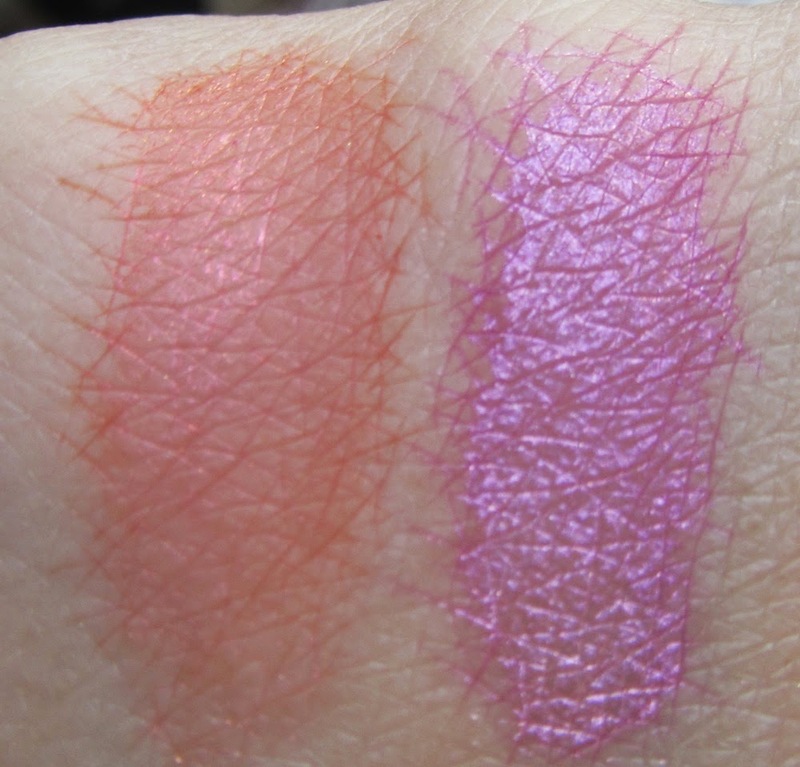 Beach Game is a gorgeous coral with pink shimmer while Pink Palace looks like a dark plum in the tube but when applied, turns into a surprisingly shimmery metallic candy pink that has a more frosty finish compared to Beach Game. 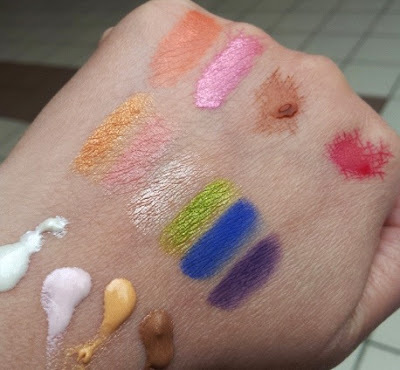 Don't judge these by how they appear in the tube as they look very different when applied. Beach Game looks like a clear neon orange in the tube similar to Aqualip Jelly Tint in Dancefloor Flirt from the Summer 2012 collection but it is actually quite different once applied. 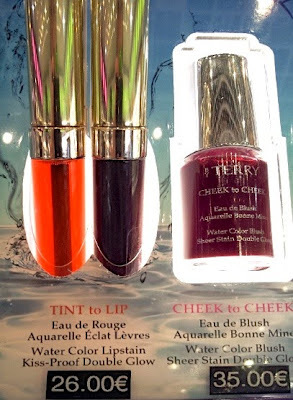 The Cheek to Cheek in Cherry Cruise is another watercolor stain for the cheeks, supposedly with a 'cellophane transparency or subtle satin finish'. I found the packaging of this rather strange as there is no dispensing mechanism for the glass pipette under the cap, i.e. it can't be squeezed or pumped out. Instead, the pipette just drips the cheek stain onto your skin. The Tea To Tan watercolor bronzer has the same packaging, except in a slightly larger bottle. 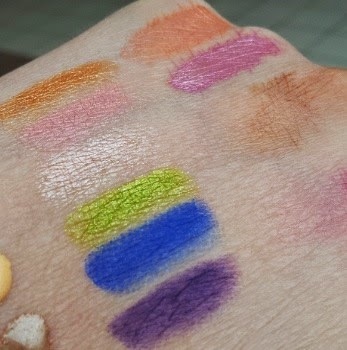 Cherry Cruise and Tea To Tan are swatched in the top right corner of the pic below. 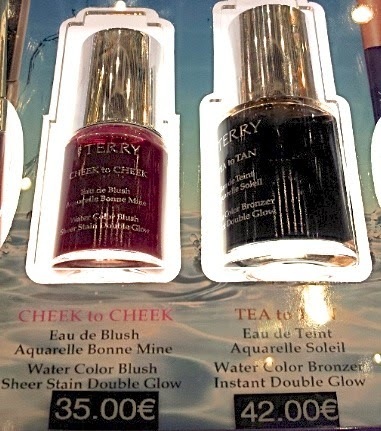 The pic below shows Cherry Cruise and Tea To Tan blended into the skin. Cherry Cruise can be built up to quite a pigmented stain as you can see. 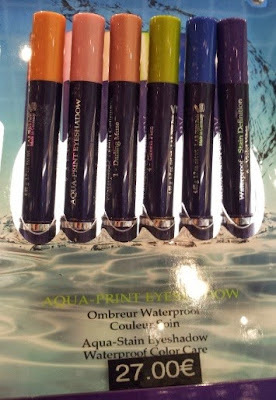 The Aqua-Print Eyeshadows are basically jumbo crayon eyeshadows similar to those by Clinique. 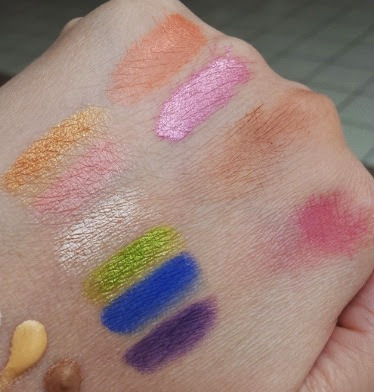 The shade names are Pink Frappe, Darling Muse, Peach Tornado, Green Tornado, Blue Fiesta and Violet Vibes. 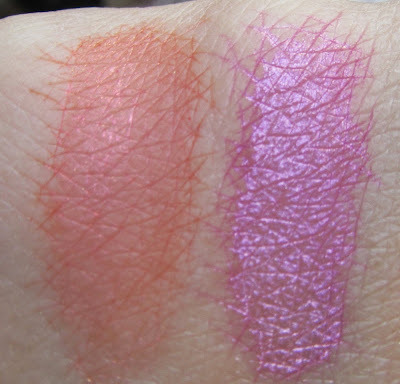 The texture and finish vary depending on the shade. Green Tornado had a rich, metallic finish and applied very smoothly in one pass whereas Blue Fiesta and Violet Vibes have more of a semi-matte finish and glides less smoothly across the skin. 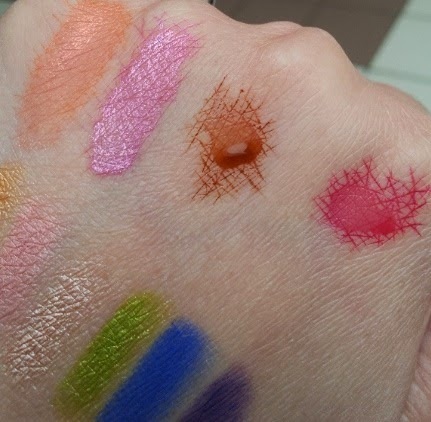 Green Tornado and Blue Fiesta reminded me of NARS Rated R, although Blue Fiesta is closer in tone to NARS Outremer and Urban Decay Chaos. 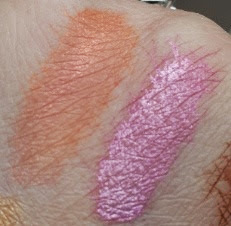 I prefer the creamier and more velvety texture of By Terry Ombre Blackstar eyeshadow sticks. Thank you for the swatches!! I love love love by terry and am happy to have this sneak peak!! I much prefer the By Terry Hyaluronic Blushes to the cheek to cheek as the Hyaluronic Blushes are easier to control. I don't use bronzer so I can't really comment on that.